Hi guys! I've got a couple posts coming your way featuring Static Lacquer. As you may remember, Stacy from Mace Polish recently re-branded to become Static Lacquer. The trio I have tonight is exclusive to the Polish Nook and will be available Friday, Sept. 28th at 8 AM PST for $11 each. The inspiration is The Munsters and I've been known to enjoy some episodes of it. I remember staying up late at my grandma's house watching The Munsters on Nick at Nite in the early 90s...am I dating myself or what?! I haven't seen it in a few years, so I definitely to get back into it for this Halloween season. If you are a flakie lover, or a crelly lover, this collection is for you. 1313 Mockingbird Lane is the address of the Munsters mansion, of course. The corresponding polish is a cement grey crelly base with UCC flakes. Dead on my Feet is a classic quote from Marilyn Munster. It's a light green crelly base with UCC flakes. Herman Munster loved to pick weeds for his wife. How sweet is that? Our house has plenty of weeds for picking if Herman is out and about in my neighborhood. Lovely Weeds for a Lovely Lady is a light blue crelly with grey undertones and UCC flakes. All of these applied the same, so I figured I'd save you the time and mention it down here. I used 3 thin coats for all of my photos, and I'd go ahead and add an extra 30 seconds between coats to make sure you don't get any dragging. They applied easily, and dried with a semi-glossy finish with no texture. I love flakies, crellies, and the Munsters, so this trio is near and dear to my heart. 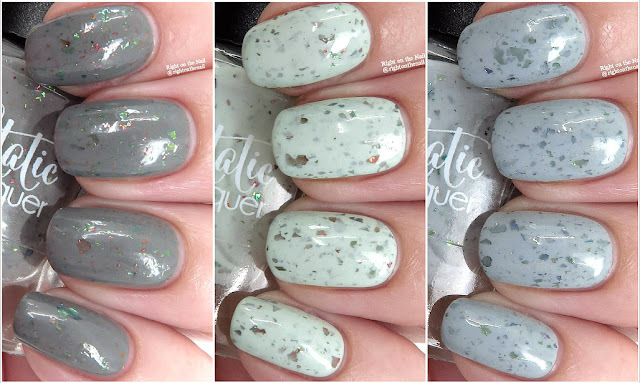 Make sure to check out The Polish Nook this Friday at 8 AM PST to get the polishes in this trio for $11 each. While you're there, make sure to see if there are any other polishes from other indie makers that catch your attention so you can save yourself some shipping. I honestly don't have a favorite because they're all special. You can learn more about Static Lacquer on their website, Facebook, Group, and Instagram pages. I think Dead on my Feet is my favorite of the three. But I do love green. Same, I love a good green!